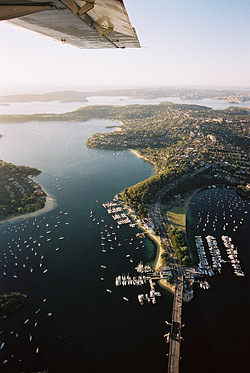 Mosman is located on the northern shores of Sydney Harbour, in New South Wales, Australia. The suburb is approximately 10km by road from the central business district of the city of Sydney. Mosman – which includes Balmoral, The Spit and Clifton Gardens – has an area of 8.5km2 with beautiful native bushland, harbour foreshores and beaches. The natural beauty of Mosman has inspired many of Australia’s artists, including Arthur Streeton, Charles Conder, Margaret Preston and Ken Done. Mosman is a relatively small Sydney suburb with about 28,000 residents. The suburb has a regional art gallery – the Mosman Art Gallery – and is home to the world famous Taronga Zoo. Mosman hosts the annual Festival of Mosman as well as popular annual events such as the Mudgee Food & Wine Fair, Hunter Valley Uncorked and the Balmoral Burn. There is also a dynamic shopping strip and restaurants housed in fine examples of Australian Federation architecture.